At heart, this is a seeker's book, a doubter's odyssey. In my experience, most people I know who fall away from religion do so because they are put off by legalism and dogmatism. You, who grew up as a godless heathen, and never suffered any of that, seem to find solace in the almost comically legalistic sections of the Bible. By the end of your story, you still claim to be an agnostic, albeit one who prays a lot. It has me wondering—can I believe your unbelief? I'm delighted that you thought I went beyond the surface to look for deeper meanings and wrestle with the Bible. To be biblically honest, I had two simultaneous—and slightly paradoxical—motivations for the book. On the one hand, I did want to play pin the tail on the fundies, as you put it. At the same time, since I grew up a godless heathen, as you say, I wanted to take an earnest spiritual journey. I wanted to see if I was missing anything. I wanted to see what I could find in the Bible that might be relevant and enhance my life. The entire dialog is worth reading if you have the time. 10/9: I saw the book's author on The Today Show on Monday and found him to be an interesting character. He seems to have read the biblical text but somehow missed the message of the bible.. at least the New Testament message. After A. J. Jacobs spent a year reading the entire Encyclopedia Britannica for his book “The Know-It-All,” he figured he had the yearlong experiment thing down. How much harder could it be to follow every rule in the Bible? Much, much harder, he soon discovered, as he found himself growing his beard, struggling not to curse and asking strangers for permission to stone them for adultery. Jacobs spent the year carrying around a stapled list of the more than 700 rules and prohibitions identified in the Good Book, and also consulted with religious leaders and spent time with the Amish, Hassidic Jews and Jehovah’s Witnesses. His Encyclopedia book was very amusing. You can see him skirt religion, while admiring it from afar (or what he thinks it is), in a very thorough way. I can see where he'd miss the point here, but he's essentially a good guy who just needs to be bonked over the head by the Holy Spirit. Look forward to a book report when you are done with the book TZ. I heard the interview with him on NPR. In the interview they focused on his time in the OT. No word on how he dealt with Grace. 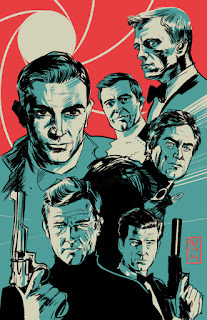 Good interview. He said that in order to avoid the law against sitting where a woman who was in her "unclean" time had sat he took to carrying around a folding chair. His wife would purposely go around and sit in every chair in the house during that "period" so that he wouldn't be able to. He also found out that the Kosher law against eating milk and dairy together comes from the prohibition against boiling a kid (baby goat) in its mother's milk. It's amazing how much like the Pharisees he had become, building a proverbial fence around the laws so he wouldn't break them. If you'd like to hear A.J. 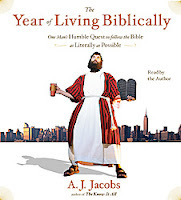 Jacobs talk about his new book, "The Year of Living Biblically," check out this audio interview link.